What did your PR Firm deliver in Q2? I’m a big believer in transparency for my PR firm. I always hear from potential clients who complain their last PR firm kept them in the dark and never delivered any media placements. Here’s a closer look at what Macias PR delivered for our clients from April to June 2017. The PR industry as a whole hit the $14 billion dollar mark last year, according to The Holmes Report. But let’s get to what really matters: how much does PR cost for you? In the ideal world, you would Google this question and come back with an instant numerical answer. It’s not so straightforward in real-life. Every public relations campaign is customized specifically to the client’s goals, so the cost will vary by campaign needs and the complexity of the campaign. The more complicated the campaign, the more resources will be required. All of that drives up price. The best PR campaigns always begin with a great story idea. Media placements don’t begin with reporter contacts or even an email address. They start and end with a narrative that provides new information with a character that subconsciously promotes the company. Before Macias PR launches any media campaign, we first think of the interesting angle or story. Our team doesn’t focus our energy on the product or service we are trying to get into the news. We think of the type of story that the media outlet will cover. Then we work backwards and try to uncover the relatable angle that allows us to position our clients into the story. In the children’s book, The Little Engine that Could, the train keeps telling himself, “I think I can, I think I can, I think I can.” That perseverance is needed to succeed in PR. You can’t quit when reporters say no thank you to your idea. But more important than that, you need to identify a story that is interesting. No one ever said understanding PR is easy. In fact, many business owners don’t understand the subtle difference between advertising and PR. In the book, The Fall of Advertising and the Rise of PR, the authors drop many memorable one liners like: “Advertising cannot start a fire. 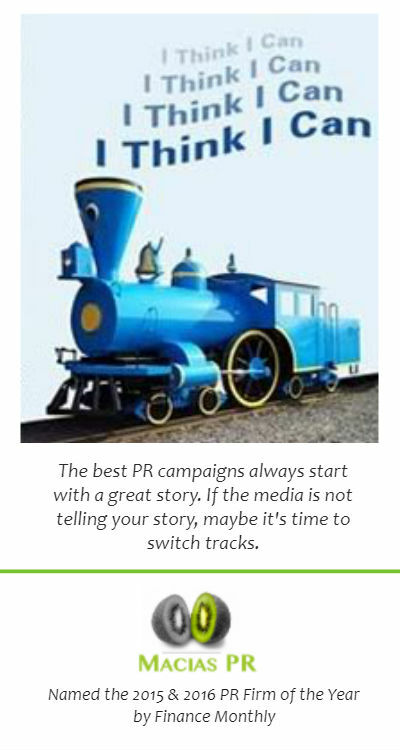 It can only fan a fire after it has been started.” In their analogy, PR is the fire starter. So how do CEOs or entrepreneurs go about setting fire to their business? The first step is to understand what PR is and if your business will benefit from the service. The Daily Caller recently asked me to write an editorial, giving advice to the next White House spokesperson. What can she do to get off to a better start than press secretary Sean Spicer? What should she do differently to improve the White House relationship with the media?